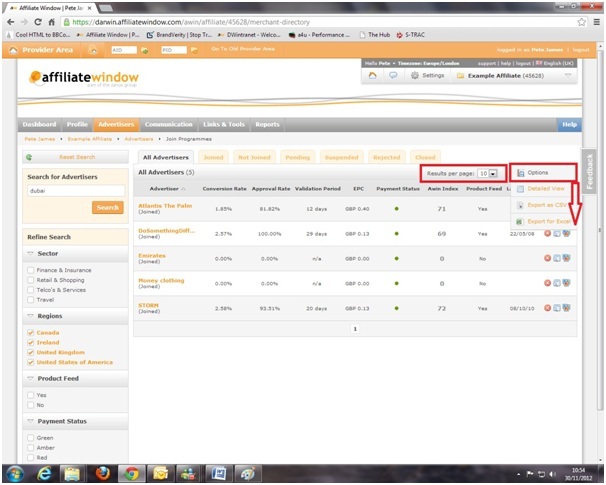 The Advertiser Directory in the interface allows publishers to browse for, and potentially interact with, advertisers. 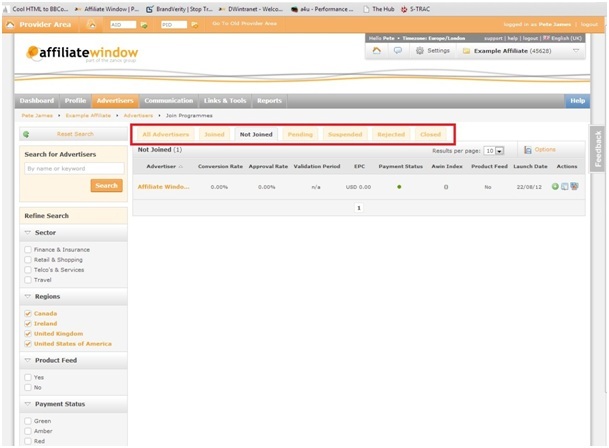 Within the directory a publisher can browse advertisers based upon their membership status, view advertiser profiles and refine the directory by a number of criteria. Step 6 – You are now ready to refine your search. And/Or you can select the sector. The sectors expand to reveal more niche options, as can be seen in the example below. 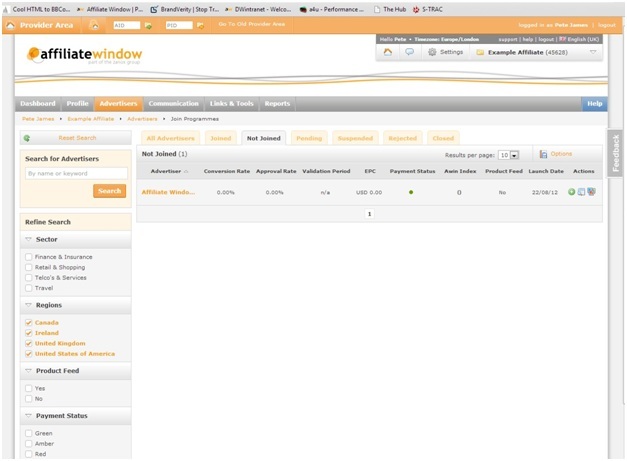 Step 7 – Once you’ve got your results you can see information on their conversion rate, approval rate etc. These are all very useful when deciding which programmes to join. Step 8 – And when you’ve got what you need you can hover over “options” and then export the information. This will enable you to further filter in the excel sheet and save a list of the ones you want to work with. 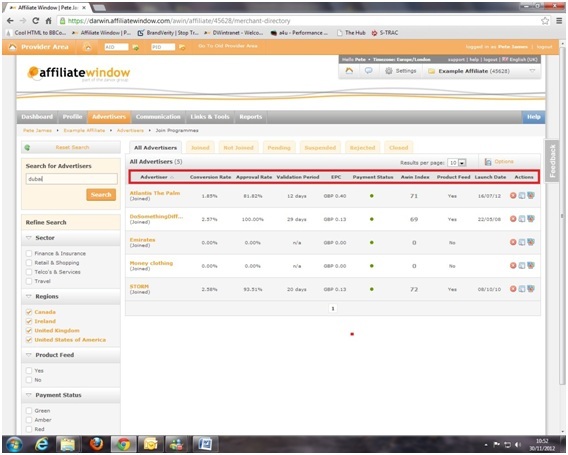 This will show all of the advertisers that fit within the criteria that has been specified. This will show all of the advertisers that do currently have a membership with the publisher account that is viewing the directory and fit within the criteria that has been specified. This will show all of the advertisers that do not currently have a membership with the publisher account that is viewing the directory that fit within the criteria that has been specified. 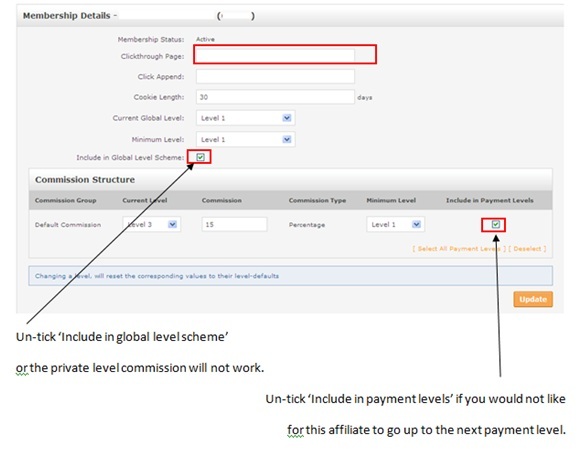 This will show all of the advertisers that the publisher account has a pending membership with (a membership that is waiting for a response from the advertiser) that fit within the criteria that has been specified. This will show all of the advertisers that have suspended a membership with the publisher account that is viewing the directory that fit within the criteria that has been specified. This will show all of the advertisers that have rejected a membership with the publisher account that is viewing the directory that fit within the criteria that has been specified. This tab will detail to the publisher browsing the directory a list of all of the advertisers that once had an affiliation with the browsing account but have since closed their programme on the network. Such accounts cannot be interacted with as they no longer have a live programme and are just there so that publisher s can gauge how an advertiser closure might affect their campaigns. An publisher can also refine the search even further with the filters providing one with more relevant results. 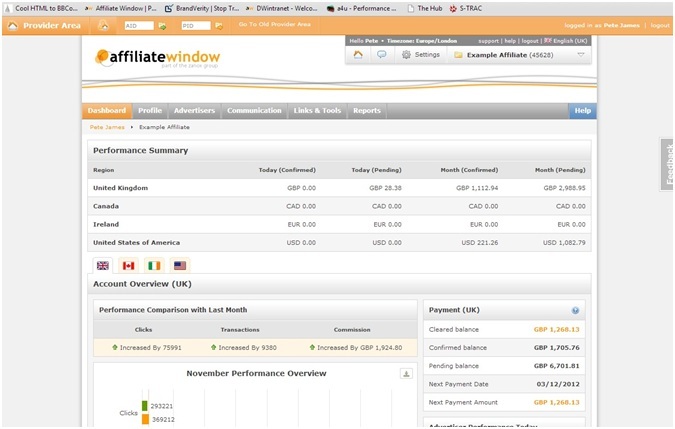 These filters can be used with or without a keyword search and narrowed down with the various elements on the left hand side of the directory; a publisher is able to refine by Sector, Datafeed (yes or no) and Advertiser Payment Status. Toggling the detailed view will open up a host of more information allowing a publisher to get a snapshot of the advertiser without viewing their full profile. 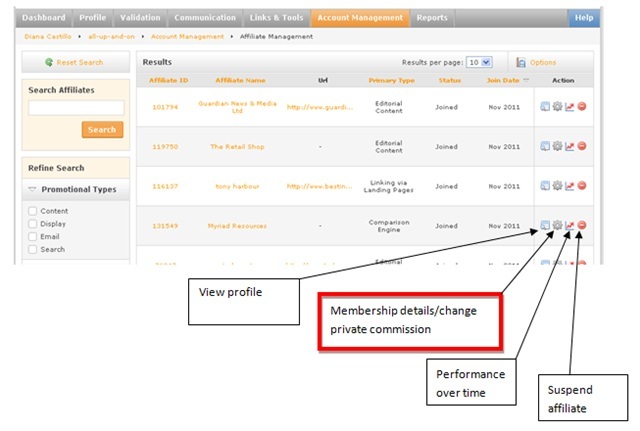 In the detailed view a publisher will see the advertiser logo, description and a min/max commission/lead value. Once you have found an advertiser that you wish to work with you simply have to request entry onto their programme. You can do this by clicking on the Join button on their profile. This will send a note to the advertiser indicating your desire to promote them via your publisher business and they can then act upon that request. The directory is constantly growing as more and more advertisers join the network. This tool is designed to open up the relationship between advertiser and publisher , opening the channel of communication will only result in more successfully run programmes and a better return on investment.